The final round of the AT&T Pebble Beach National Pro-Am will take place on Monday with strong winds and rain meaning no play was possible on Sunday. None of the 68 players left in the field got out of the clubhouse on Sunday and the opening threeball will tee off at 7.30am local time, 3.30pm GMT. The weather forecast for Pebble Beach today isn't great and the event's organisers have confirmed that at least 50 percent of the field must complete their final rounds for it to count. American Dustin Johnson has a four shot lead ahead of Mike Weir, with Retief Goosen a further shot back. 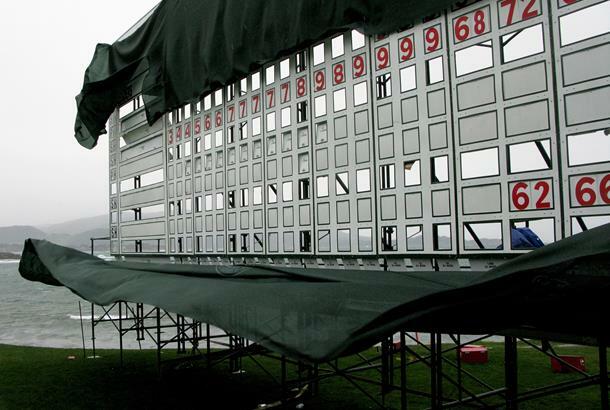 "I don't think the wind is going to be as strong tomorrow morning," said PGA Tour vice-president of rules and competition Mark Russell. "We're mandated by the regulations to do everything we can to play 72 holes, so we're going to see what we can do tomorrow. "If we find that we're not going to be able to finish tomorrow, we'll make a decision at that time." This delay will affect the TG Fantasy League, meaning you won't get your weekly update email or be able to change your team until after the events conclusion -probably on Tuesday morning. Click here to see the latest leaderboard.